The Kit File Maintenance application allows the user to design and maintain kit structures. A kit is essentially a flat bill of material that maintains single level relationships between a parent item and a group of components. This application can be useful to businesses that assemble end items from purchased components. It gives them some of the advantages of a bill of material package without the expense or complexity. Kits may be ordered through the Order Entry application in the Customer Order Processing package. The user is allowed to adjust kit pricing and may print components on Order Acknowledgements, Quotes and Invoices. If the Rollup Price field in Item File Maintenance is set to Y for the kit item, the kit's price will be calculated as the total of the components' prices. If the Rollup Price field is set to N, the kit's price will be taken from the Customer Order Processing Price Code File, if there is an appropriate price code on file. If not, the price will be taken from the Selling Price field in the Item File. Making changes to kit component quantities and adding or deleting components is not allowed during Order Entry in Customer Order Processing. Kits may be made available at locations other than the default location contained in the Item File by adding locations in the Location Control File Maintenance application. When setting up alternate locations, be sure that all components of the kit are also available in those locations. This is an add-on feature. This utility can be used to either import a new kit structure or modify an existing kit structure. Modifying an existing kit structure may cause a quantity allocation integrity issue, if the parent item has activity. Since this problem can be easily resolved through the Reset Qty Allocation utility, import utility will only give a warning message when this happens. Contact Netcellent or your Elliott Reseller for more information about this utility. * Select the desired mode from the Kit File menu bar. Enter the increment, which will be used to determine the next default sequence number when entering new kit component records. The increment is added to the last sequence number used by the parent to determine the default sequence number. The default is 10. Enter the item number to be used as a kit item. This item must be designated as a kit item in the Item File (field #73 End Item Code) and must be set to K. Kit items may not be components of other kits, of feature items, or of product structures. In the add and change modes, press the F7 key to search by item number or the F8 key to search by item description. In change mode, press the F1 key to search for existing kit items. 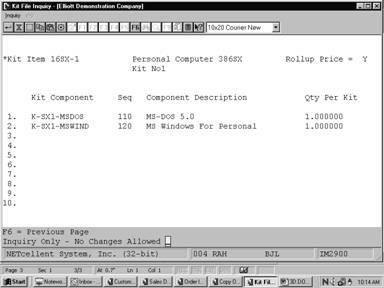 This field displays what was entered in the Rollup Price field for this kit item in the Item File Maintenance application. If this field is Y, the kit's price will be rolled up from the prices of its components. If this field is N, the kit's price will be taken from the Price Code File in Customer Order Processing, or, if there is not an appropriate price code on file, it will be taken from the Selling Price field in the Item File. 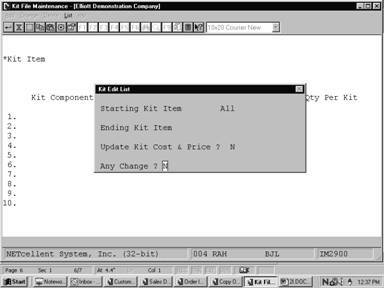 Enter the item number to be used as a component of the kit parent item. Kit components may not be kit parent items, BOMP feature items, or parent items in BOMP product structures. To change a component in the kit, set the Qty Per Kit field to zero. This will delete the component. 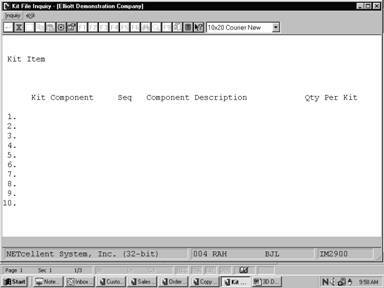 You may then enter a different component with the deleted sequence number or re-enter the deleted component with a different sequence number. To insert a component, enter the new component on the last screen of components. 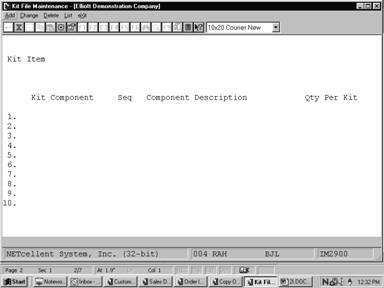 The sequence number you assign it will determine where it is placed in the component list. For example, if your existing components are incremented by ten's (10, 20, 30, etc. ), you could assign a new component a sequence number of 15 for it to appear between the first and second components. When you press Return after entering a component, it will automatically appear in the correct place. Press the F7 key to search by item number, the F8 key to search by item description, or the F10 key to end component entry. Enter the sequence number that will be used to link this component with the kit parent item. The sequence number may not be zero and a kit parent item may not have multiple components with the same sequence number. 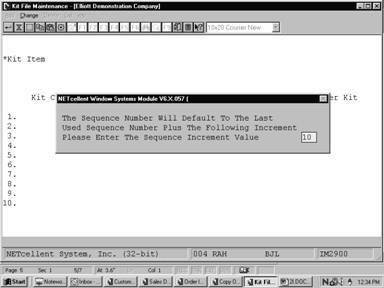 The default is the last used sequence number plus the increment. In change mode, this field may not be changed. The description of the component is automatically displayed. Enter the quantity of the component required to make one kit parent item. To make changes to kit component structures after components are entered, change this field to zero to delete the component and then re-enter it with any changes. The default is 1. Enter the starting kit item number for the range to be printed. Press the F1 key to search for existing kit items. Press the F1 key to search for kit items. The default is All kit items. Enter the ending kit item number for the range to be printed. Press the F1 key to search for kit items. The default is the starting kit item number. Update Kit Cost & Price ? Enter Y to update the kit item's cost and price. If you answer Y, you will be asked if you wish to override the Item File Maintenance Rollup Price flag or to only update those kit items that are flagged for price rollup. 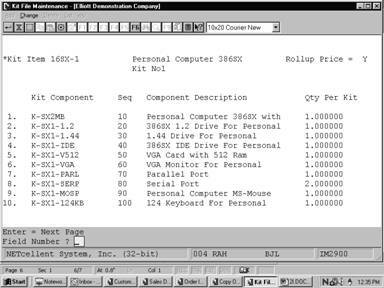 To rollup a kit's price, the program will add the prices of its components and update field #16 (Selling Price) in the Item File. To rollup a kit's cost, the program will add its components costs and update the kit's average, last and standard costs (field #'s 24, 25 and 26) in the Item File. The Kit File Inquiry application allows the user to quickly display the components of any kit parent item. The kits may be viewed but not changed. Further information and field descriptions for the data displayed in this application may be found in the Kit File Maintenance section of this manual. Enter the kit item number whose components are to be displayed. Press the F1 key to search existing kit parent items. Press the F7 key to search by item number or press the F8 key to search by item description.